Sasha's 4th of July manicure featuring nails inc. 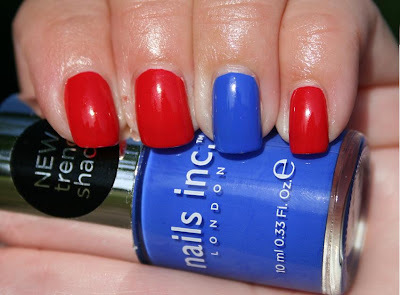 Included in my recent samples from nails inc were two shades that I thought would be perfect for the 4th of July holiday. I'm not talented enough to do nail art, but I figured I could definitely manage the accent nail trend! Each color required only 2 coats to get perfect coverage. I continue to be impressed with nails inc. Creams are usually hard for me to apply for some reason, but I had absolutely no problem with these. nails inc shades are available at Sephora and retail for $9.50. Wow, I love that blue color! I've gotta check that one out!